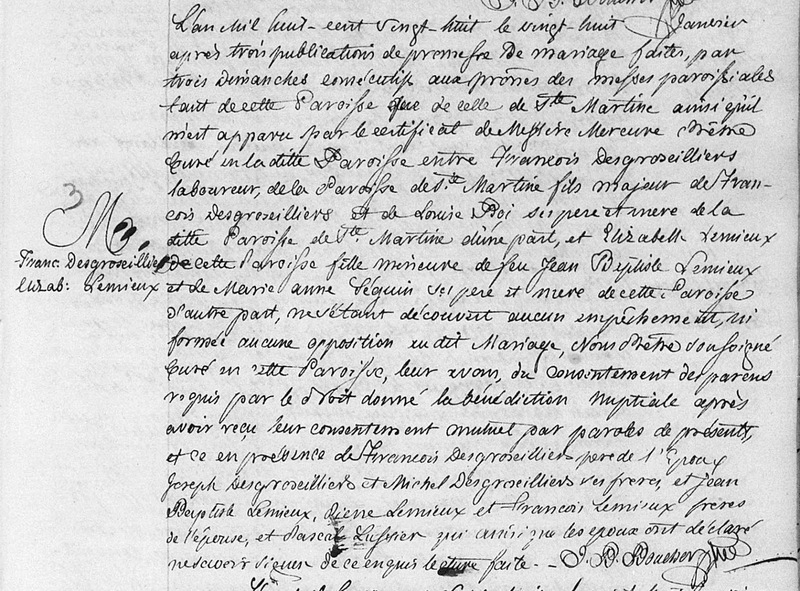 After their wedding, François and Elisabeth went to live in his home parish of Ste-Martine, in nearby Châteauguay county. Most of their eleven children (six sons and five daughters) were born here, including younger son Pierre, who is my 2x maternal great-grandfather. François died in August 1853. Elisabeth survived him by thirty-eight years, and died in July 1891 in Embrun, Russell County, Ontario. 1. 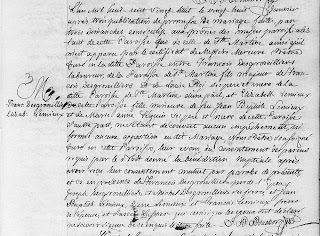 "Québec, registres paroissiaux catholiques, 1621-1979", digital images, FamilySearch (https://familysearch.org/pal:/MM9.3.1/TH-1961-28006-26428-80?cc=1321742 : accessed 21 January 2016), La Prairie > Nativité-de-la-Prairie-de-la-Magdeleine > Baptêmes, mariages, sépultures 1821-1835 > image 300 of 734; nos paroisses de Église Catholique, Quebec (Catholic Church parishes, Quebec).